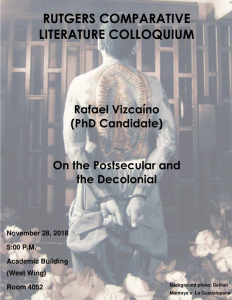 On Wednesday Nov. 28th, 2018, students and faculty from the Program in Comparative Literature convened on the fourth floor of the Academic Building for the second and final colloquium of the fall semester on secularism, postsecularism, and decoloniality by doctoral candidate Rafael Vizcaíno. Having just returned from a short stay at the National Autonomous University of Mexico (UNAM) as part of the inter-university Critical Theory in the Global South initiative (itself part of the International Consortium of Critical Theory Programs, funded by the Andrew W. Mellon Foundation), Rafael began by sharing his experiences concerning the ongoing dialogues between critical theory and decolonial thought and practice on both sides of the border. 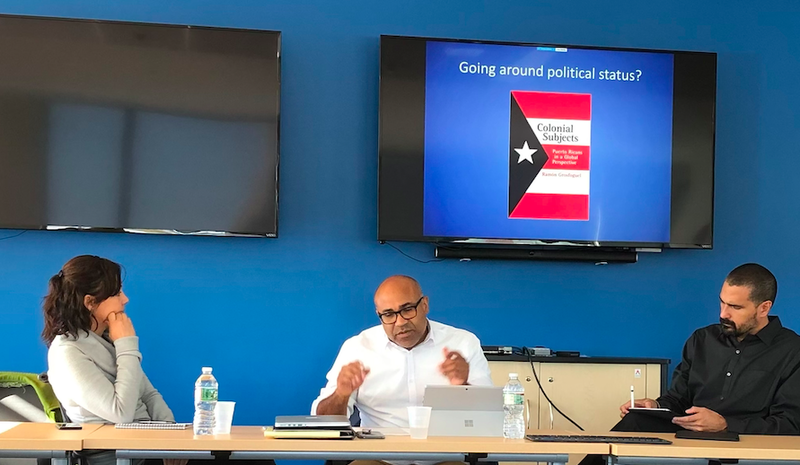 Rafael mentioned that the spark that ignited his research on the postsecular has been the rise of visibility and the connections between what is often called religious fundamentalisms and conservative political movements all over the world. Hence, his chapter is not a study on these recent historical developments, but a questioning of the epistemic frameworks used to talk about these and other related processes, such as processes of modern secularization. In particular, Rafael asked what it could mean to “decolonize” the conversation on the roles of religion and secularism in contemporary global social and political processes. Given the aforementioned rise of religious movements as political actors in the global public sphere, Rafael argued that scholars across the social sciences and humanities have accordingly started to re-think the idea that western modernity is no longer (if it ever was) “secular”. Many of these discussions have fallen under the umbrella of what has come to be known as “the postsecular turn” in method. While they have been very productive in unmasking the disciplinary and methodological limitations of secularity as an implicit presupposition of scholarly practice, according to Rafael, these discussions have had almost nothing to say concerning the connection between such disciplinary secularity and the “coloniality of knowledge”. This gap has allowed Rafael to position his own work as providing a decolonial intervention into the analysis of the postsecular. For Rafael, perhaps no other intellectual formation has made as many strivings towards a decolonial critique of secularism as women of color feminisms have done. Accordingly, the second half of his presentation engaged the work of the Chicana lesbian writer Gloria Anzaldúa, particularly her concept of la facultad and the performative way in which it is theorized in her Borderlands/La Frontera. Rafael sees in Anzaldúa’s work an explicit attempt to make a “politically-committed and spiritually-rooted scholarly practice that dismantles the secular/religious divide in a process of epistemic decolonization that aspires to theorize and bring forth new forms of being and knowing beyond those available in modernity/coloniality.” In the work of Anzaldúa and other women of color thinkers such as Jacqui M. Alexander and Sylvia Wynter, Rafael sees a conceptual redefinition of the postsecular from the perspective of epistemic decolonization. In their works the connections between secularity and coloniality are made in a way that being postsecular necessarily entails decolonial thinking and doing. This is different from how postsecularity is discussed by mainstream European and North American philosophers, sociologists, and anthropologists. Rafael’s talk was followed by a one-hour session of questions and answers where several topics were raised, such as the relationship between religion and spirituality, the secularity of close reading and its relation to decolonial and postsecular disciplinary practices, as well as the relationship between spirituality and irrepresentability. 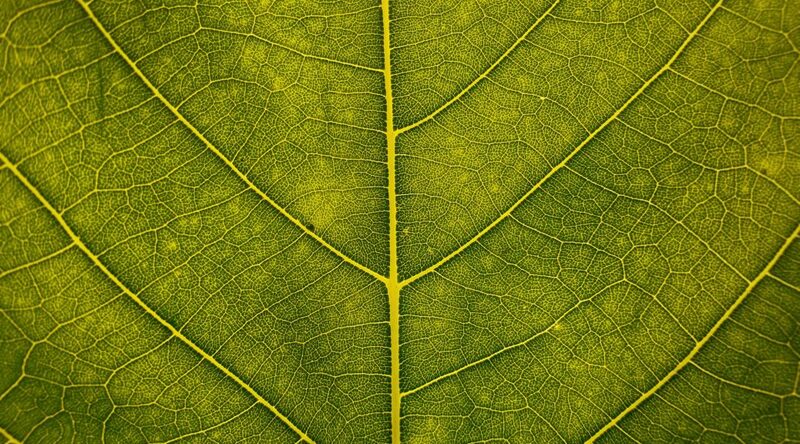 After a lively discussion and many insightful inputs from professors and colleagues alike, everyone proceeded to a table of food and wine and carried on with the philosophical ruminations. Many thanks to Rafael on bringing a revelatory topic to the evening, and congratulations to him on a very successful colloquium! A couple of weeks ago, on October 25th the Rutgers Advanced Institute for Critical Caribbean Studies with the sponsorship of the Center for Cultural Analysis and the Program in Comparative Literature held a series of activities focused on decoloniality in South Africa, Latin America and the Caribbean. 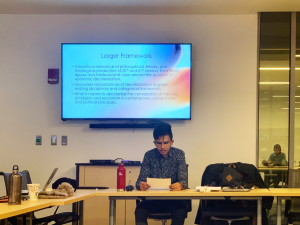 The final activity for the day was the book presentation of: Smash the Pillars: Decoloniality and the Imaginary of Color in the Dutch Kingdom and Kuxlejal Politics: Indigenous Autonomy, Race, and Decolonizing Research in Zapatista Communities. This was held at the community center headed by Lazos America Unida in downtown New Brunswick. The center was organized to accommodate everyone around tables with Mexican sarapes (colorful cloths) and the session was able to start on time at 4.30 pm with an introduction from Prof. Nelson Maldonado-Torres. After speaking to the importance of the work that Lazos does with the Mexican immigrant community in New Brunswick, Prof. Maldonado-Torres presented Prof. Mariana Mora, from the Center for Research and Advanced Studies in Social Anthropology in Mexico City, Prof. Melissa F Weiner from the College of the Holy Cross in Massachusetts, and Prof. Antonio Carmona Báez, President of the University of St. Martin, St. Marteen. Prof. Mora began with a brief presentation of her book Kuxlejal Politics: Indigenous Autonomy, Race, and Decolonizing Research in Zapatista Communities published by University of Texas Press in 2018. Her main motivation with this book was to understand what decolonial strategies Zapatista communities mobilize to fight against the Mexican state’s neoliberal and racialized policies and assert their autonomy. She went on to describe how, despite the state’s denial to speak of race and racism, indigenous peoples are constantly living under violent and racist conditions. For example, indigenous peoples often either work a land they have no ownership over or face state and private actors that value their land over their lives and livelihoods. Prof. Mora contends that this structural violence and continuous plundering led to the political moment where indigenous peoples from Chiapas decided to rebel against the state. Embeded in the conversation was also a recognition that this structural violence is a remnant of colonial power and economic structures, such as the plantation system. She then went on to explain how the Ejército Zapatista de Liberación Nacional (Zapatista Liberation Army, EZLN) transitioned from an armed struggle and its declaration of war against the Mexican state in 1994 towards a focus on defining and defending their autonomy. This led to building autonomous institutions and a full break from all public systems, including health and education. Prof. Mora was involved in the effort to define autonomous pedagogical methods and educational programs with other academics and members of Zapatista communities. Therefore, for her book she returned to Zapatista communities to co-design her methods with community members and generate a research project that would answer her questions and the communities’ needs. The result of this collective work was a focus on autonomy and the politics of a collective life, tied to a territory and nature, in her own words: “when you are fighting against genocide, the political is the fact that we are alive”. Prof. Weiner followed this presentation, thanking the invitation and emphasizing how happy both she and Prof. Carmona Báez were to present this book in a non-academic space. She explained that since Smash the Pillars: Decoloniality and the Imaginary of Color in the Dutch Kingdom is about decolonial struggle and resistance she found it extremely important that people beyond the academy become involved in the conversation. She started her presentation by linking New Brunswick itself, and even Rutgers University, to the Dutch colonial past and slavery. 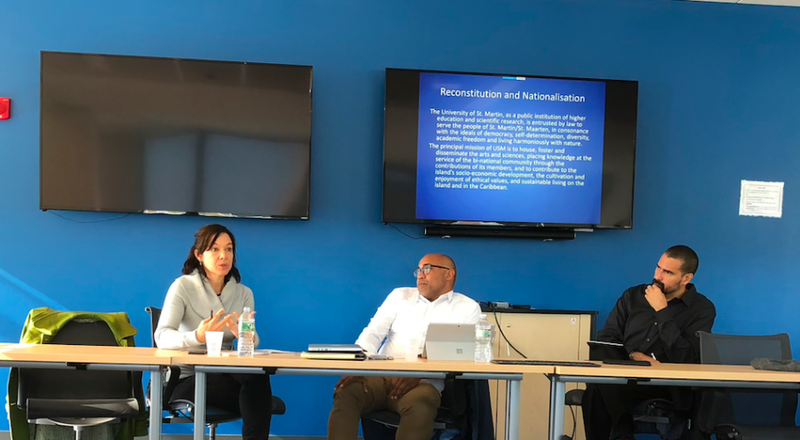 Since the book focuses on Dutch colonialism and the struggle to decolonize its narrative and memory, she emphasized the direct connection it has to this Dutch colonial history and its ties to slavery, which are often silenced or ignored. Prof. Carmona Báez then added a personal perspective to this history by drawing on his own experience as a Protestant Puerto Rican from New York and being “spiritually conditioned by the Dutch and Calvinism”. With this context both editors then turned to the book itself, starting with an explanation of the title. They explained how Dutch society was built on specific pillars framed under religion. 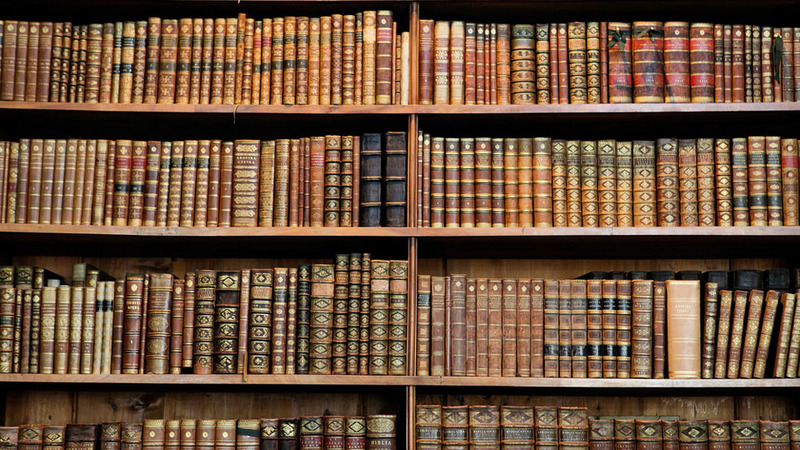 Thus, Protestants and Catholics each had their own banks, schools, and churches. Other pillars were added in the 19th and 20th centuries based on workers and women’s movements, broadening the definition of identities in the Netherlands. However, all of these pillars were designed to exclude. Similar to Prof. Mora’s description of Mexican racialized institutions and policies, these pillars did not include enslaved peoples or the indigenous peoples whose lands they took. As the title suggests, these pillars should be broken down to liberate the different narratives, histories, and bodies that have been silenced. They went on to describe a growing movement from the past eight years that focuses on raising consciousness of racism in the Netherlands, despite the constant negation of this reality, and the need to learn these other histories. Both local and international struggles have come together at this particular juncture in cases such as the fight against black face tied to the Dutch Christmas figure Zwarte Piet (Black Pete) and Black Lives Matter in the United States. The editors presented this juncture as an example of how colonial pillars are being smashed across the world. They then turned to the structure of the book and how they consciously went against the traditional structure of having theorists first and then activist authors. As part of their decolonial method in the first section they center activists’ fight against racism with specific suggestions from activist students on how to decolonize the university. The second section is more theoretical and focuses on decolonial thought in the context of Dutch colonial history. They closed by turning their focus to ‘the imaginary of color’, defined as the collection of narratives, (hi)stories, and art expressions, that counter the official story, that counter the pillars. The decolonial imaginary of color is also transatlantic and emphasizes a historical trajectory that reaches up to today. Hence, both these books spoke to the need to smash the concept of a unique History, colonial power structures that remain, and racist pillars that are designed to exclude. 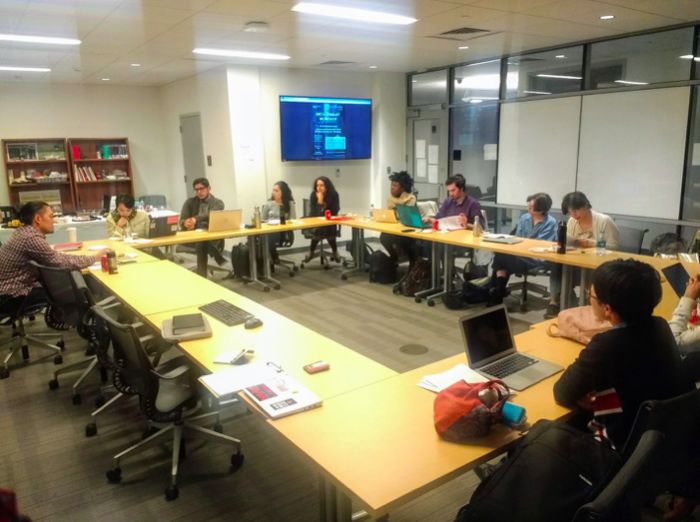 The Decoloniality Workshop held its only meeting of the fall semester on October 17th, 2018, to discuss Haruki Eda’s (Sociology PhD candidate, Rutgers University—New Brunswick) dissertation chapter entitled “Koreanness Beside Itself: Queer Mobility and Diasporic Belonging.” The chapter examined how some diasporic Koreans in the U.S. draw from embodied, sensorial, and emotional experiences in political organizing and forming a sense of community. In particular, it examined the role of queer diaspora as a modality of community organizing in articulating a different sense of Koreanness that creates other possibilities than those offered by hegemonic, heteronormative, nationalist figurations. In his presentation, Eda contextualized the chapter and explained further its place within his dissertation project. His dissertation is an ethnography of Korean American community organizing, drawn from fieldwork with a number of community organizations who do largely transnational work (such as taking trips to Japan and Korea to meet with local organizations there and to build solidarity between the movements in U.S., Korea, and Japan). While these grassroots organizations were not formally labeled as queer or feminist organizations, a majority of the members were Korean women and queer people who brought their experiences and critical points of view into their organizing. The project tracks ways in which these organizations resist reifying national boundaries and nationalist identification to instead be more expansive in recognizing those who are seen as less Korean because of their differences, such as being diasporic, LGBTQ, or Zainichi Koreans (the communities of Koreans in Japan). This project instead turns toward the embodied experience of being Korean as at the intersection of the discursive and materialist in grounding the reality of being Korean. Jeong Eun Annabel We (Comparative Literature PhD candidate, Rutgers University—New Brunswick) served as discussant for this meeting. 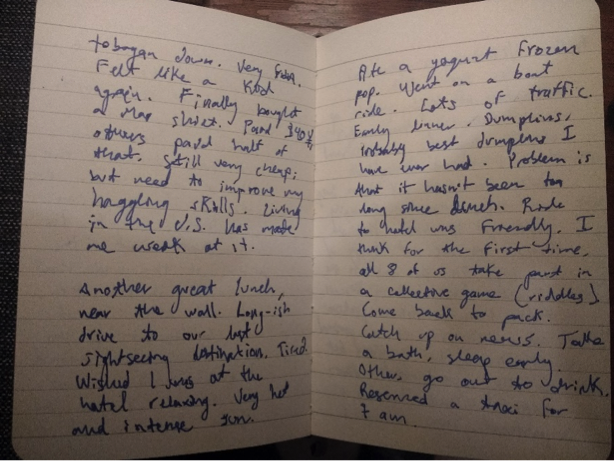 In her comments, she first highlighted the special atmosphere that the chapter had in its writing, and how this is experienced powerfully in reading it. She noted how the queer Korean organizers of Eda’s ethnography undergo transformations in their understandings of both queer and Korean identities beyond the hegemonic narratives that they couldn’t see themselves in. In light of these processes of redefinition for the participants, she suggested giving more space in the chapter to exploring the moments of realization and transformation. She also asked about the role of ceremony and ritual in this chapter, and how certain practices and spaces within these organizing communities take on spiritual, ceremonial, and ritualistic characteristics. One particular example of this was the way in which the poongmul drumming practice that Eda analyzes in the chapter transforms a political rally space and enacts a collective and spiritual enactment of non-human agency or intersubjective agency. With these insightful questions opening the conversation, the workshop then had a vibrant discussion of a range of questions and comments about Eda’s chapter and project as a whole. 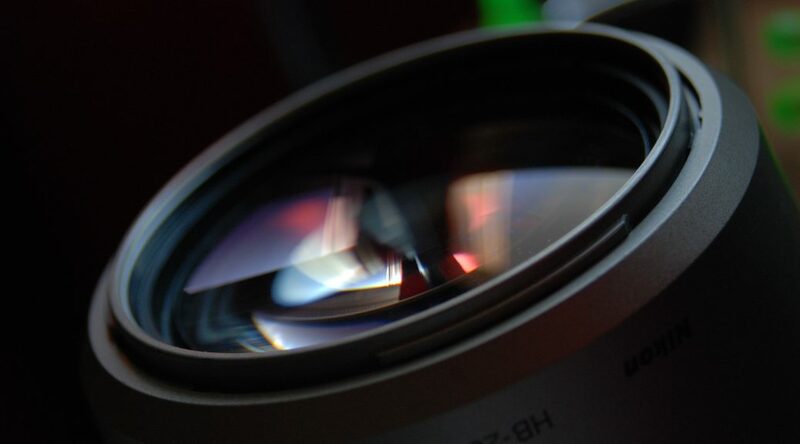 Some of the major features that came up in this discussion were Eda’s methodological contributions in approaching this project in the way that he does, reflecting on the theoretical engagements in the project, suggestions of different literature to bring into the project, and the project’s place within sociological scholarship. 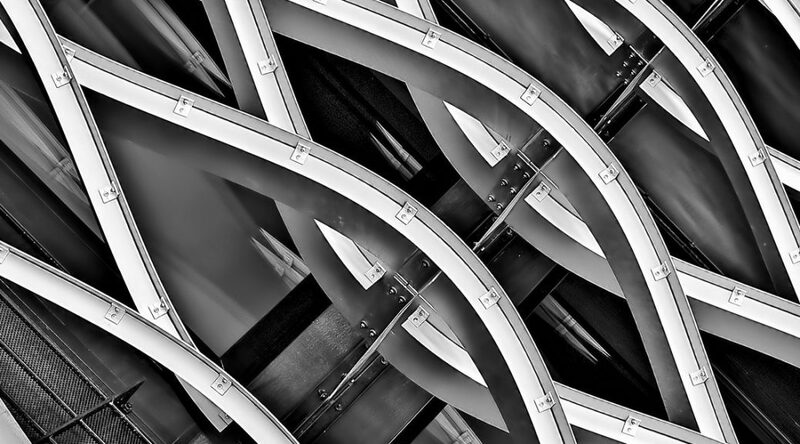 The Decoloniality Workshop is an interdisciplinary space for scholars in training to present work in progress in a relaxed academic setting committed to the transformation of standard academic practice. Please visit https://decolonialityworkshop.wordpress.com/ for more information about past and future events. For the fourth event of the “What is Decoloniality?” speaker series, the Rutgers Advanced Institute for Critical Caribbean Studies, the Center for Cultural Analysis, and the Program in Comparative Literature were proud to host Dr. Mariana Mora (Center for Research and Advanced Studies in Social Anthropology, México) and Dr. Antonio Carmona Báez (President, University of St. Martin, St. Maarten). On the morning of October 25, Dr. Mora and Dr. Carmona Baéz gave a talk titled “Decolonizing Knowledge and Research in ‘Latin’ America and the Caribbean.” This was the first talk in the speaker series that featured two scholars in conversation and listening to them side-by-side allowed us to understand that even though there are commonalities in the experience of colonization, we should be careful not to make generalizations and should instead be mindful of the nuances and particularities of the distinct modalities of colonialism and their effects on different communities. Dr. Carmona Baez, co-editor of Smash the Pillars: Decoloniality and the Imaginary of Color in the Dutch Kingdom (2018), focused on St. Maarten, a constituent state of the Dutch Kingdom. He opened the discussion by highlighting the dichotomy of servitude vs. ownership that he has witnessed at the University of St. Maarten. The university specializes in hospitality, which is directly related to the fact that revenues from tourism are the backbone of the island. However, the business program is growing steadily because students are interested in owning corporations. This is due in large part to colonial powers and investment banks creating a market for international entrepreneurs. This is often followed by the emigration of qualified students, which Dr. Carmona Báez describes as a brain drain to the island, or, unsustainable recovery and development. To offset that, Dr. Carmona Báez proposes a decolonial sustainable recovery and development, which is based on brain gain. This means creating the conditions for the “return of the diaspora”: the return of the knowledgeable people that have left the island. He also proposes the use of local research and community-based development. He closed his portion of the talk by talking about jollification: a celebration of collective efforts. This celebration occurs as members of a community build houses and the elderly sit with children to tell them their histories. For him, a big part of decolonial recovery and development is precisely this kind of activity, where action and celebration happen not separately but simultaneously and, most importantly, in community. Dr. Mora, author of Kuxlejal Politics: Indigenous Autonomy, Race, and Decolonizing Research in Zapatista Communities (2017) discussed the form her research took in writing her recently-published book. Dr. Mora opened by saying that academia is not absolved from neo-colonialism and explained how academic research has colonial overtones: it is seen as an extractivist knowledge wherein base/raw material that takes the form of oral histories provided by subjugated peoples is provided to a researcher, who then makes meaning out of that information by classifying and systematizing it in writing. Though the Zapatistas accepted that Dr. Mora do research in their communities, they redefined the terms of that research. First, they rejected Dr. Mora’s plan to conduct individual case stories in favor of a collective story in the form of group interviews. They also rejected Dr. Mora’s proposal to do a deep study of two communities, since they believed that this would silence the rest. Instead, they required that she go to at least twelve of the thirty-five municipalities. In their most decolonial action, they subverted the notion of extractivist knowledge. During Dr. Mora’s interviews, the Zapatistas themselves prepared their own synthetizations of their own histories, which they then read out loud, thus destabilizing the oral/written dichotomies and the suggestive power of the binary. This allowed them to have an active role in the production of knowledge and in the process situated themselves as subjects of their own histories. The exchange challenged us to think about coloniality and decoloniality across geopolitical frameworks and reminded us that the effects of colonization are still being felt and require radical praxes. It also provided us with original, context-sensitive responses from agents actively fighting colonial epistemes and redefining knowledge in their day-to-day lives. Looking back to this summer seems so far away it is hard to think that it only happened a few months ago. The first thing that comes to mind is sunshine and walking around different cities. I started the summer at home, enjoying warm weather and dog-sitting, as I planned out the field research I would do. My general goal this summer was to reconnect with colleagues across feminist movements in Mexico and visit feminist collectives and organizations that use literature in their projects. However, I was also interested in establishing new contacts and learning more about cartoneras and decolonial thought. As a follow up on my class on Spanish American short stories with Prof. Marcy Schwartz, and thanks to her support, I contacted cartonera groups and interviewed them about their work. 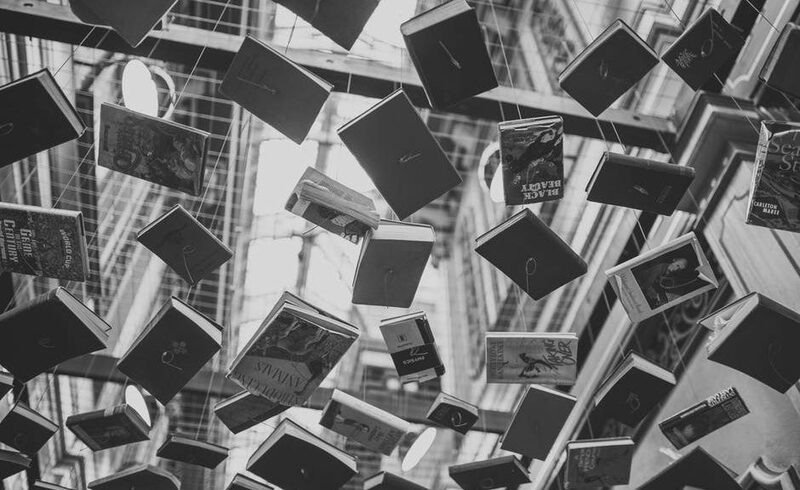 I wanted to understand if there were any connections between self-narrative and storytelling efforts and self-publishing. 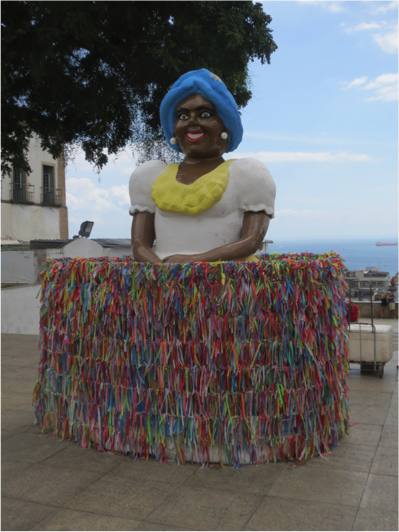 Additionally, following a recommendation from Prof. Nelson Maldonado-Torres I applied to the summer school on Decolonial Black Feminism in Bahia, Brazil and was accepted. Although I had initially planned to do research in 8-9 cities in Mexico it slowly became clear that this was overly ambitious considering time and funds. For example, I hadn’t factored in time for transcribing and processing the data, traveling more than two or three times a month would be unrealistic. I also needed time to reach out to people and buy plane tickets that were quickly escalating in price. Therefore, in May I set up my geographic trail for the summer; between June and July I would visit five cities in Mexico, and end the summer at Bahia and Sao Paulo in Brazil. I loved my summer work since it gave me the opportunity to watch independent theater productions, learn how to make books out of cardboard, speak with activists, visit new places, and rethink my research project. My time in both countries added new concepts and ideas to my incipient dissertation project such as space, race, self-publishing, decolonial feminisms, and positionality. I was particularly struck by the origins of cartoneras (simply put, these are editorial groups that make cardboard-based artisanal books) and the different aspects that inspire their work: independent editing, responding to editorial monopolies, socioeconomic issues in Latin American countries, the aim to socialize literature that would otherwise be inaccessible to people, bringing literature and craft together, participating in youth-driven projects, etc. In addition to visiting groups in Mexico I was able to speak with Dulcineia Cartonera in Sao Paulo, which is located next to a recycling site. 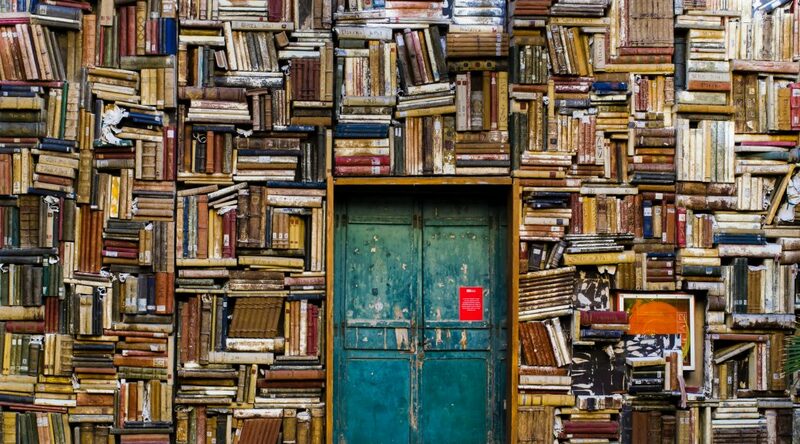 Seeing the different spaces that cartoneras work in (editor’s homes, small bookstores, rooms/offices next to recycling sites, loaned spaces, etc) made me think of the centrality of space in literary production and activism. This relates in part to the physical space of where cartoneras do their work and hold their workshops, for example, but also space as related to performance and theater. Space also came up when I spoke to theater companies or LBTQ collectives and organizations that use theater as part of their creative and activist work. In some cases these groups choose to use public spaces and the street. In others, part of their activism involves having a space of their own for their and others’ performances and theater productions. Hence, this experience led me to rethink the concept of space, and the practical elements attached to having a physical space for activist groups. In some cases, groups do believe that having a physical space benefits their work, and in others they see their mobility as a positive aspect. Not only this, but many groups spoke about the threat of shrinking space for both cultural projects (specifically in the case of Guadalajara) and feminist or human rights activist work. Thus, space arose as both an issue and an opportunity regarding physical space and the concept of space in a less tangible fashion. local cultural and activist groups, as well as a samba presentation-invitation to participate. The spiritual element of the exchanges and learning is difficult to put into words but made this into one of the most thought-provoking experiences of my life. 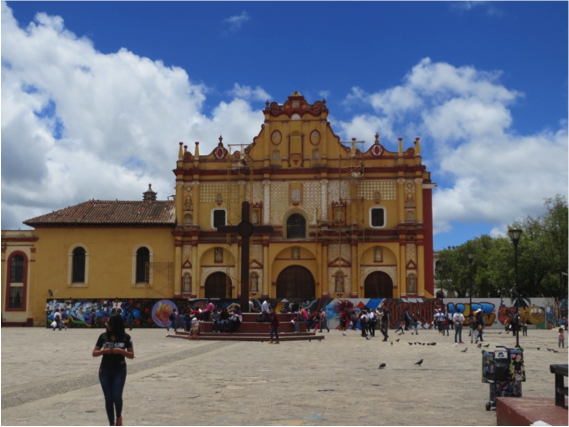 The funds granted by the Program in Comparative Literature, the Center for Latin American Studies, and the Off-Campus Dissertation Development Award were crucial for my work in Mexico and my participation in the summer school in Bahia. After this summer I was left with many questions, new ideas, and a conviction that academy and activism should be in constant communication and that we need more ‘South-South’ exchanges. My summer work has already extended into my second year under the PhD program in Comparative Literature, inspiring many of my classes and triggering conversations around my future dissertation project. In the future I hope to maintain a constant communication with decolonial and black feminisms, further my understanding and use of ‘space,’ as well as continue to put Brazil and Mexico into conversation. While the first time I read Roland Barthes’s Travels in China I found it to be a cringe-worthy example of a type of postmodern orientalism, rereading it before my first trip to China led me to wonder if what he meant by the “sideways gaze” to look at China (neither Chinese nor Western) could instead be better understood as a type of decolonial gaze. After all, Chela Sandoval recovers Barthes and semiotics into the project of decolonization. 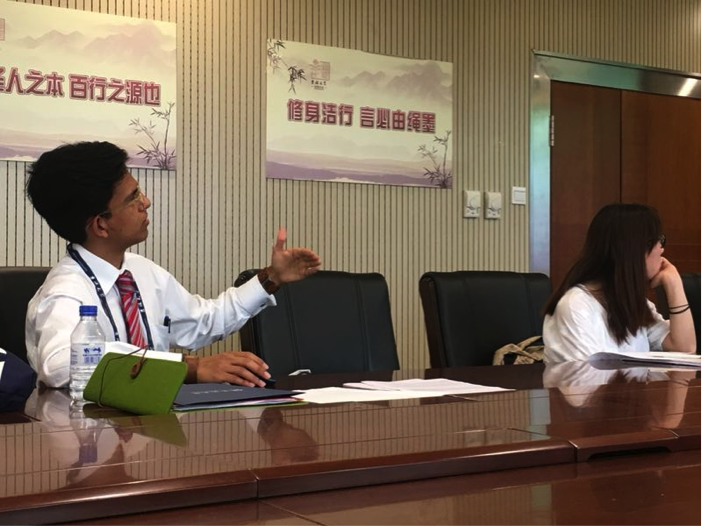 From June 23 to June 29, I had the privilege of taking part in a scholarly and cultural exchange between Rutgers and Jilin University, where I presented my dissertation research and met humanities and social sciences scholars, graduate and undergraduate students from Jilin University. This exchange, as brief as it was, has further convinced me of the importance of strengthening South-South dialogues towards the development of that new gaze through which we can interpret our world-making practices beyond modern/colonial lenses. 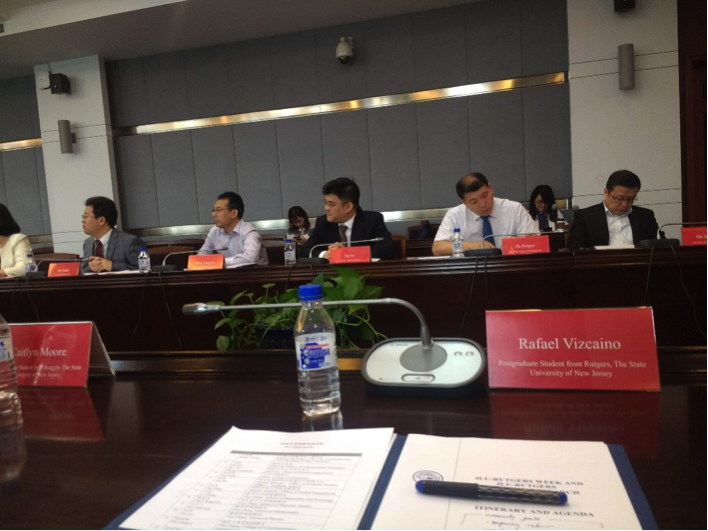 The format of the scholarly forum consisted of concurrent colloquia across disciplinary boundaries. As the sole humanities scholar in the entire event, I was part of a group of psychologists and sociologists whose work analyzed how social identity markers of difference affect both the self-perception and the social role of marked subjects, e.g., biracial American college students or provincial Chinese women in urban settings. Such multidisciplinary audience was an ideal interlocutor for my work on the epistemic critiques decolonial thinking makes on method across fields and disciplines. Given the limited reception of decolonial thinking in that particular audience, however, I decided not to present my prepared paper on the coloniality of secularism and instead presented a contextualization of decoloniality vis-à-vis the historical formations of anti-colonialism and postcolonial studies. The ensuing discussion on the significance of importing foreign methodological frameworks to the analysis of an-Other socio-cultural and historical reality was very rich and conducive to future conversations across colonial/imperial differences, e.g., Latin American, African, and East Asian critiques of Western modern methodologies. Besides the scholarly component of the forum, I had the opportunity of visiting several museums in the city of Changchun, as well as taking part in a cultural exchange with students from Jilin University where all of us learned about the educational systems of our counterparts. I found this event to be extremely fruitful because students’ questions about the American university system were honestly answered by Rutgers doctoral students. Among these included very serious and difficult questions, such as intellectual theft or other abuses of power like sexual harassment by one’s supervisors. After the event, there was an informal period of about ten minutes where we could have one-on-one discussions with each other. This proved to me to be the most enjoyable part of the forum, as I connected with many students interested in my areas of work, some of whom I remain in conversation today. The second part of the official visit consisted of a guided sight-seeing tour of Beijing not unlike the one Barthes describes in his Travels—indeed, I now laugh at the similarities. 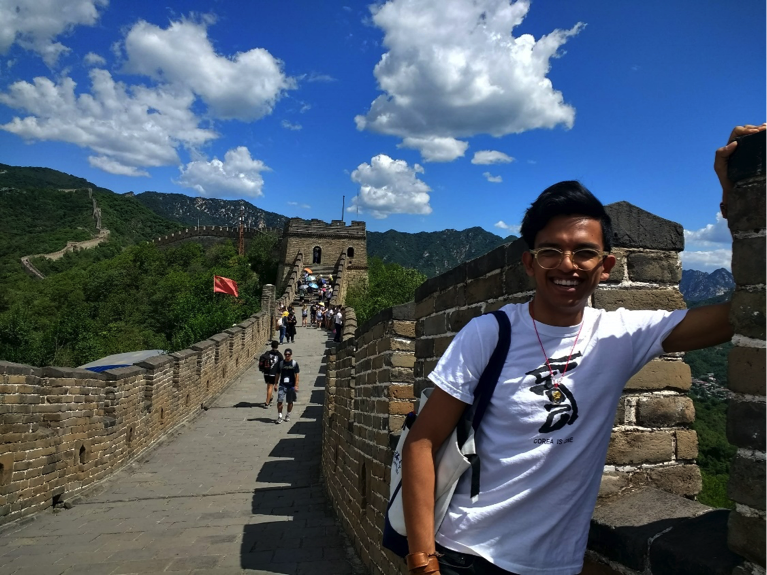 With a heat factor of over 100 degrees Fahrenheit, we visited Tiananmen Square, the Temple of Heaven, the Summer Palace, and the Great Wall over two days. The Great Wall is truly magnificent, and I hope to visit it again sometime soon. While I still cringe while reading Barthes’s descriptions of Chinese people, this trip has certainly given me new lenses through which to read his text, as well as concrete experience over what it could mean to look at China (and any other place of colonial difference for that matter) decolonially with a “sideways gaze.” I hope to continue building on these dialogues over the years to come. 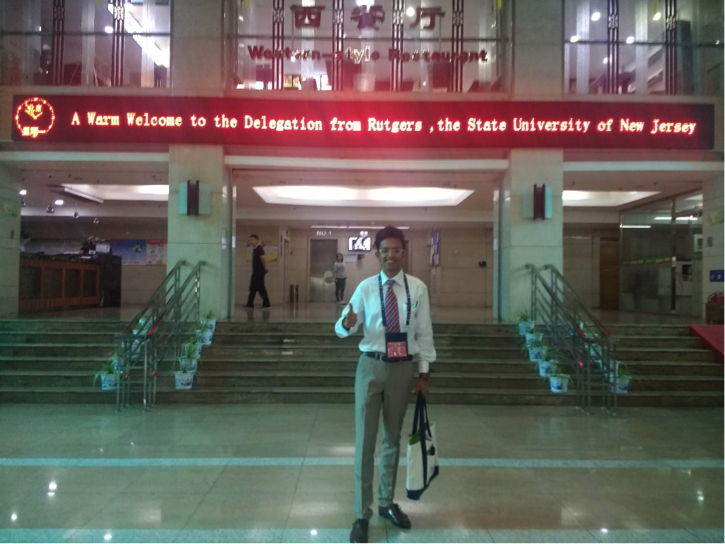 I would like to thank the Rutgers School of Graduate Studies and the Rutgers Global and China Offices for allowing me to take part in the Rutgers-Jilin Graduate Forum. Also, my gratitude goes to my student hosts at Jilin for their hospitality and incredible kindness.